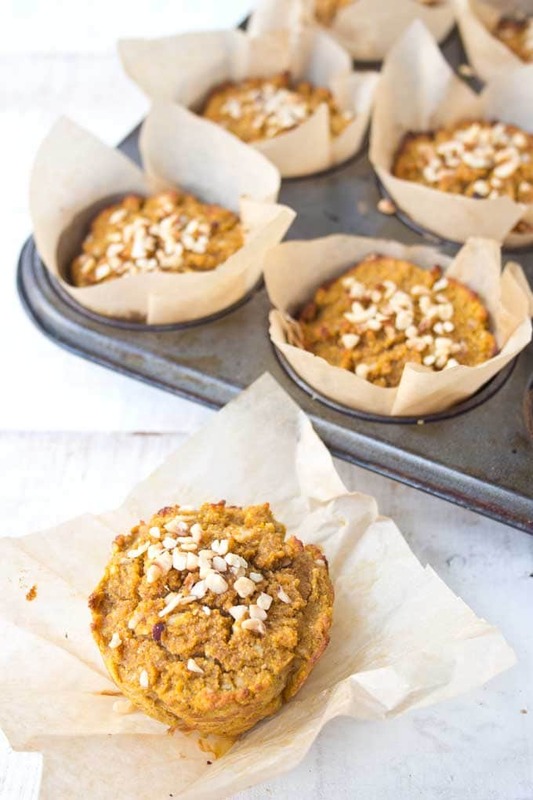 Deliciously spiced, fluffy and moist: Enjoy these healthy pumpkin muffins for breakfast or as an afternoon treat. 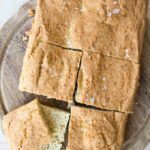 Low carb, Keto, gluten free and sugar free! It’s pumpkin season and I’m loving every minute of it! I’ve just bought a bumper pack of canned pumpkin and have been busy making pumpkin-based dishes all week. Did you know that pumpkin puree tastes delicious mixed with yoghurt? It’s been my go-to breakfast, mixed with nuts, seeds and plenty of cinnamon. And have you seen my fudgy pumpkin brownies or the sugar free pumpkin pie I posted a few days ago? 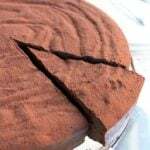 It’s so good that we had to divide the last slice into four so everyone could have some. 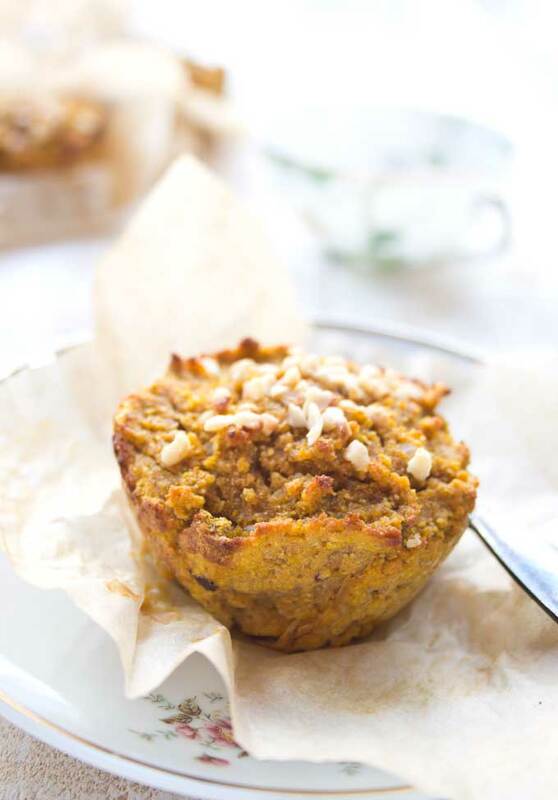 These super yummy healthy pumpkin muffins are just as delicious. Even better, they make the perfect grab-and-go breakfast! I tested the recipe a few times using the same ingredients in different amounts – and after 3 gos the muffins came out perfect. 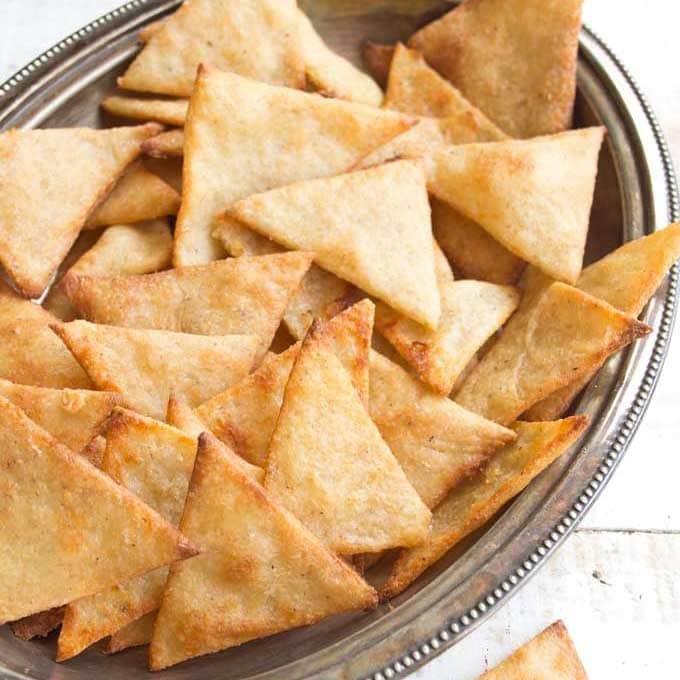 They’re crunchy on the top and delightfully moist (but not heavy) on the inside. Best of all, it’s a seriously easy recipe that comes together in minutes! 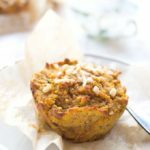 These ketogenic pumpkin muffins are sweetened with granulated erythritol and taste of all the wonderful flavours autumn has to offer – warm spices such as cinnamon and nutmeg, the gentle, earthy sweetness of pumpkin and roasted hazelnuts. 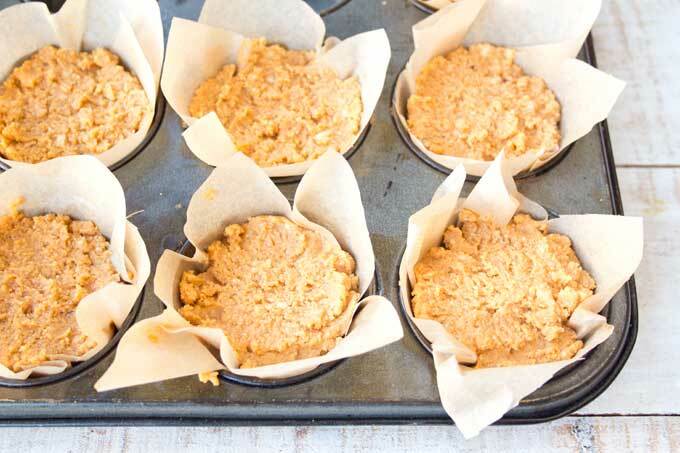 Many pumpkin muffins in the health food space use ingredients such as applesauce, yoghurt and oatmeal. All work well. 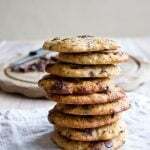 I’ve been baking grain free for a few years now, and in this recipe I’m using coconut flour. It’s my go-to gluten free flour of the moment. It’s very nutrient-dense, low in carbs and way cheaper than almond flour. 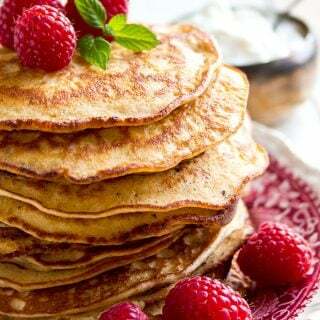 A pack lasts forever because coconut flour absorbs a lot of liquid – as a rule of thumb, you only need half the amount of coconut flour as almond flour in a recipe. First, you blend the pumpkin puree and your eggs. You can do this in a food processor or in a bowl with an electric mixer. Next, you add all other ingredients apart from the hazelnuts and mix until you have a smooth batter. 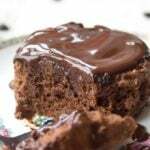 I don’t have much of a sweet tooth so make sure you taste the batter and add more sweetener if you feel it needs it. See how the coconut flour has absorbed all the liquid? I always let my batter stand a couple of minutes while the coconut flour does its magic. Then you add the nuts. I bought ready-made roasted and chopped hazelnuts, but if you can’t source them you could make your own by blitzing blanched hazelnuts and then dry-roasting them in a pan. Baker’s Top Tip: You could also use crushed pecans or walnuts here. 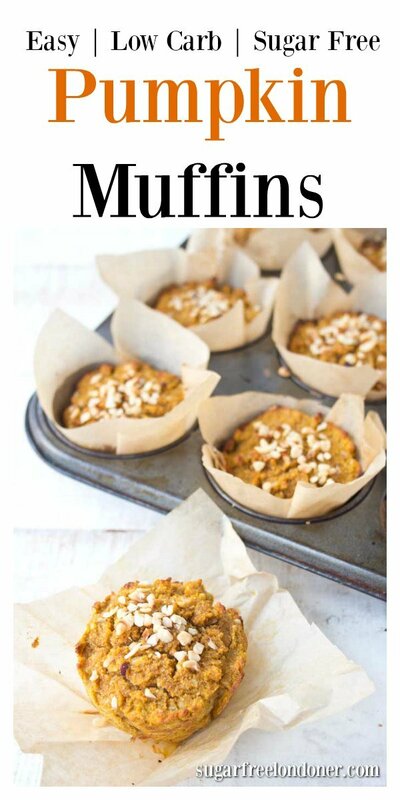 Time to organise some paper cases for your sugar free pumpkin muffins! 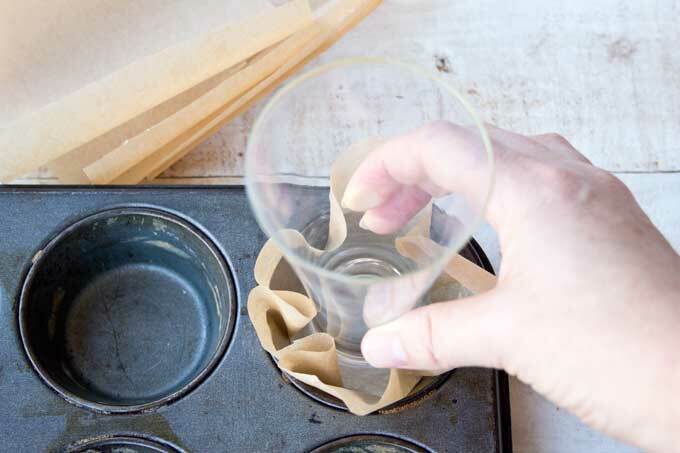 Of course, you can use store-bought muffin cup liners or a silicone muffin pan. But if you have neither, you can make your own paper cups out of parchment paper! I simply cut 5 inch squares of baking paper and pressed them into my well-used muffin pan with a glass. Don’t these home-made paper cases look so much prettier than the regular paper cups? Needless to say, they are super cheap. 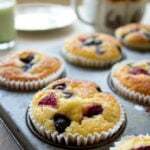 I used around 2 heaped tablespoons of muffin batter for each muffin. Then you flatten the tops, scatter over some more hazelnuts and bake them for about 25 minutes or until a knife inserted comes out clean. In the name of testing them properly, I’ve eaten 2 of these babies today already!! Canned pumpkin is available all year round in the US and during autumn and winter you can get it in UK supermarkets such as Waitrose and Tesco. Unfortunately, in some parts of the world it’s hard to get hold of. So what to do if you want to whip up some low carb pumpkin muffins and you can’t get your hands on a can of Libby’s? Well, you make your own! You heat the oven to 200 Celsius / 400 Fahrenheit. Cut your pumpkin in half, scoop out the seeds and lay the halves flesh-side down on a baking sheet lined with baking paper. Roast the pumpkin for 30-45 minutes (time will depend on the pumpkin size). Wait until the pumpkin has cooled. Then scoop out the flesh, discard the skins and blend to a smooth puree. I used this granulated erythritol to sweeten my healthy pumpkin muffins. You could use powdered sweetener instead. Or even go for a brown sugar substitute like this one – this would also work well with the autumn flavours. If you wanted more sweetness, you can also add 4-8 drops of liquid stevia, which is the equivalent of 2 teaspoons of sugar. You can get caramel or cinnamon flavours! Ran out of coconut flour? You can replace the coconut flour with 1 1/2 cups of almond flour. 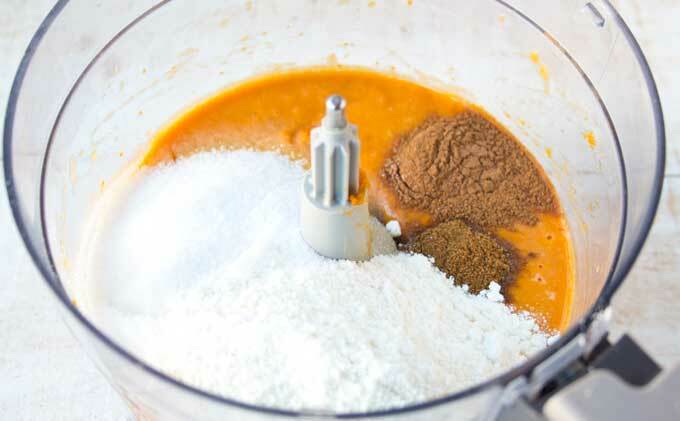 For dairy free pumpkin muffins simply use coconut oil in place of the butter. 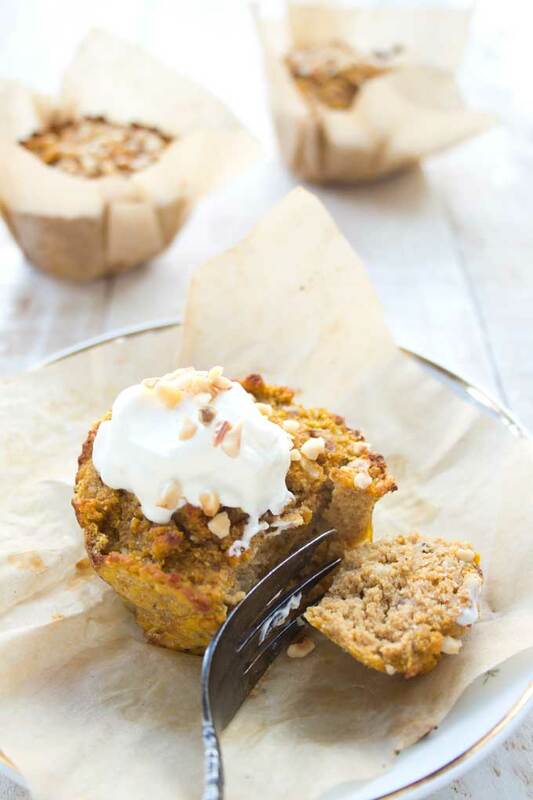 You'll love these healthy pumpkin muffins! They are packed with flavour and come together in minutes. 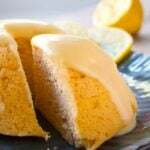 The recipe is low carb, ketogenic and sugar free - perfect for diabetics. 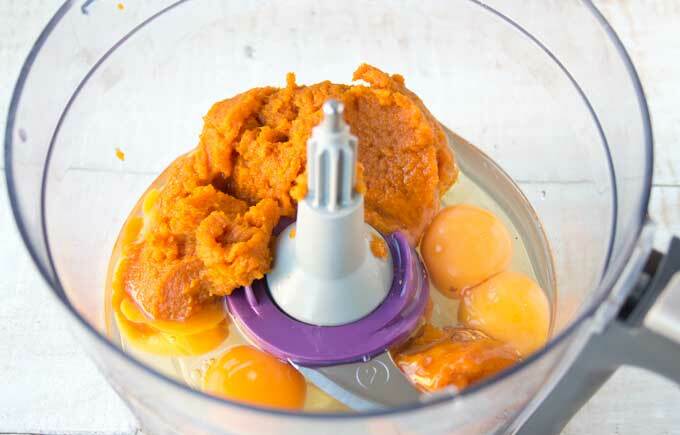 In a food processor or in a bowl with a hand-held electric blender, mix your pumpkin and eggs until smooth. Add the all other ingredients except the hazelnuts and blend until smooth. Last, add the hazelnuts, if using, and blend briefly. You want them to add some crunch! 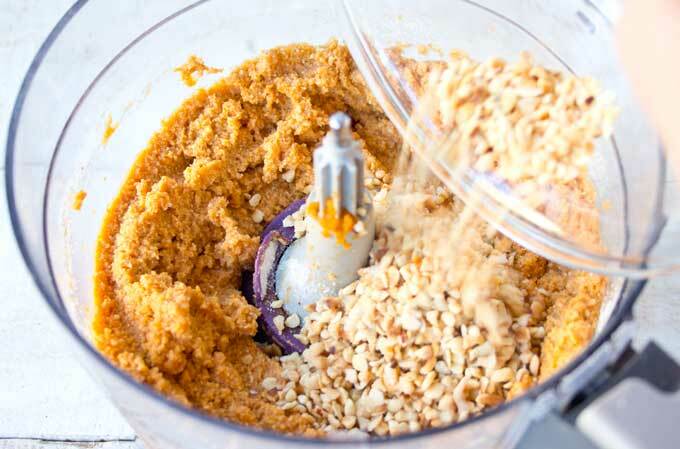 The hazelnuts are not essential for the recipe, but their flavour works really well with the pumpkin. Let the batter sit for a couple of minutes so the coconut flour can absorb the moisture. Then scoop into a muffin pan lined with paper cups and sprinkle with hazelnuts. Bake around 25 minutes or until lightly browned on top and a knife inserted comes out clean. See the post how you can make your own cafe-style paper cups. Can't get hold of pumpkin puree? Instructions on how to make your own are in the post. Serve on its own or with either whipped cream or sour cream. 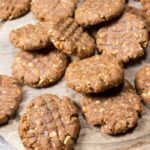 you mention ” 1 tsp pumpkin spice / mixed spice in the “HEALTHY PUMPKIN MUFFINS WITH HAZELNUTS” and mixed spice in “the LOW CARB CHOCOLATE BANANA MUFFINS” what is that mixed spice? The most important ones are cinnamon, nutmeg and ginger – basically, that autumn/Christmas flavour combo. 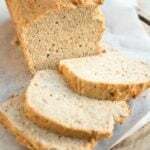 I’m anxious to make these after having great success with your almond flour bread. I don’t like anything coconut, can I substitute almond flour? If so, how much? I’m so excited to have found you and to try your recipes. 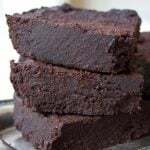 Thank you so much for all your work to provide recipes for us gluten and grain free people. Yes, you could try doubling the amount stated for coconut flour. I have not tried making the muffins with almond flour, but that’s the amount I would go with (almond flour is less absorbent than coconut flour so that’s why you’ll need more). See if you end up with a good consistency and take it from there. Hopefully it’ll be a success! Hi Bettie, what a shame! It’s always so hard to figure out what went wrong when you weren’t there. If you did measure all ingredients as per recipe, maybe reduce the oven time if you wanted to try again? I did try this recipe a couple of times with a more liquid dough and found that version to be too eggy. How are these 3.7g of total carbohydrate, yet have over 5g of fiber? Something seems off on your nutritional information. – In this product, the Fibre is extremely high. The rule of thumb is that if the fibre is higher than the total carb amount, you don’t end up with negative carbs. Net carbs can never be lower than sugar, so your sugar , in this case, would be your net carb amount. – In this product, the Fibre is extremely high. The rule of thumb is that if the fibre is higher than the total carb amount, you don’t end up with negative carbs. Net carbs can never be lower than sugar, so your sugar, in this case, would be your net carbs.